Kelli Dunham and Genne Murphy (Co-producers) are two friends who together have explored the challenging process of creating autobiographical or semi-autobiographical work; preserving and making sense of their own stories by sharing them with each other and a greater audience. Read Kelli and Genne’s bios HERE. 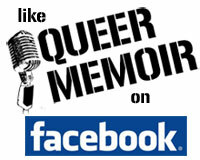 Queer Memoir writers/performers/storytellers share one thing in common – a queer identity. “Queer” is a very broad term, which may intersect with any number of other identities or communities of which we are a part. There may not exist one unified, comfortable queer community inclusive of all our various different experiences, but we hope to offer a safe space to share multiple voices, experiences and identities within this spectrum. Queer is an imperfect umbrella word, and we realize it comes with a legacy of hurt and rejection for some; at one of our Philadelphia events, we even had a storyteller who shared about why he hated the word queer. True story. But if you do not identify or connect to the word “Queer”, but you do identify as Lesbian, Gay, Bisexual, Pansexual, Transgender, Butch, AG, Femme, Sissy, Mary, etc., or have a history of being culturally allied with these identities or communities please consider submitting your work and being a part of this series. I attended the reading on “Scars” and was wowed by the work and attendance. I’m a friend of Ryn Hodes (a reader that night)…I’d like to submit some work and read at one of your upcoming salons. Thanks..and a very Happy Pride! !